These didn't turn out quite as well as I had hoped, but they're tasty nonetheless. As you can see from the picture, I ran into trouble with shaping the cat's "ears". 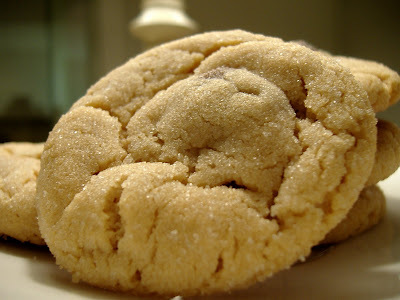 If you try these, make sure to make the ears on the large side since they blend together while baking. The recipe called for red-hots, but I used Reese's Pieces instead. 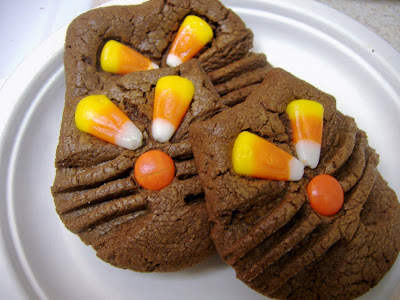 I also took the cookies out halfway through and added the candy, as per a reviewer on All-Recipes. Ohhh my goodness...these are amazing. I really need to put them away, or there will be none left for my coworkers tomorrow. 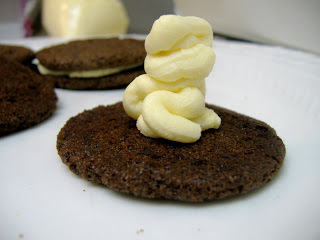 This is post #6 on this blog, and post #2 using a recipe from Smitten Kitchen. I don't know food blog etiquette yet, so I hope it's not rude to borrow recipes and drool all over my keyboard while doing so. I had to reduce the cooking time on these a bit, down to 8 minutes. I used the Toll House chocolate chunks, and creamy JIF peanut butter. Replicating Magnolia goodness in my apartment almost makes up for the fact that I ended up in DC instead of NY after college! 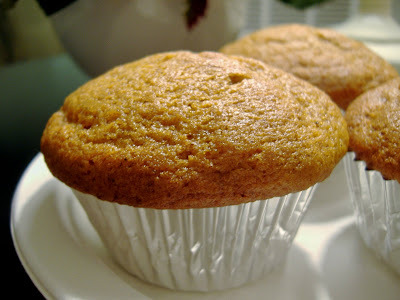 I decided to make these simple muffins to use up some leftover pumpkin I had from the previous recipe. These are quite tasty, unadorned muffins with just the right amount of spice. I also overfilled the pan (I consider a muffin top a GOOD thing in baked goods ;) ) and ended up with 7 generously sized muffins. This recipe is going in the permanent collection - it's very easy to whip up, and would take well to additions - cranberries, raisins, cinnamon chips, etc. Next time I'll definitely follow the instructions and put the cinnamon sugar mixture on top - the Muffin Top blogger's photos look delish! Today was an absolutely GORGEOUS day in Washington, DC, and it put me in the mood to bake something fall-ish. 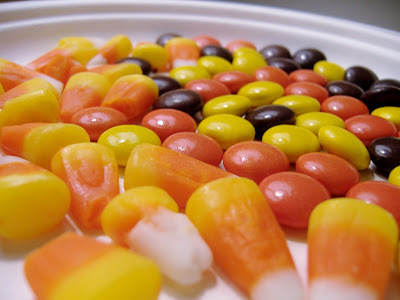 I found this recipe on the Nestle website, and decided it would nicely take care of my pumpkin craving. 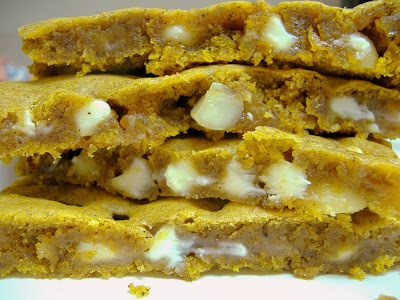 These pumpkin bars are very tasty, but if I make them again they're going in a 13x9 pan. I used my jelly roll pan, but as you can see from the picture, the bars are super thin. These aren't good bars for a bake sale, or for mailing. They're fragile, and would be great served as a warm dessert with vanilla ice cream. Hopefully I'll have another pumpkin recipe up tomorrow, as I have a lot of pumpkin left over from this. The grocery store was sold out of the regular sized cans of pumpkin, so I bought a huge one knowing I'd use it. 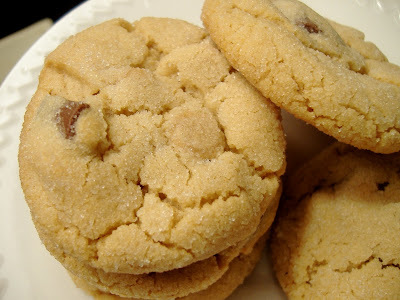 I've always thought of these classic cookies as more of a Christmas treat, however, I had Crisco left over from another recipe, and needed to find a use for it. It's been years since I've had these cookies. 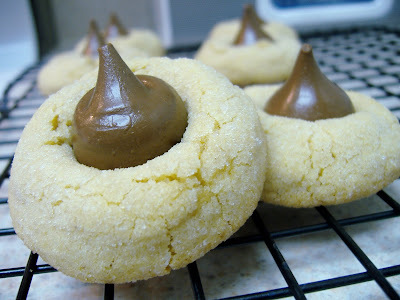 My mom never bakes anything with peanut butter, so as a child I was always really excited when these showed up at a holiday party or cookie exchange. They're just like I remembered - light PB taste, crispy outside and chewy inside. 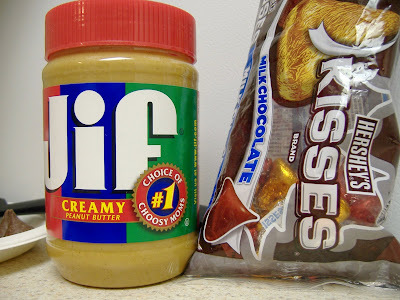 I used the recipe from the JIF peanut butter website, but reduced the cooking time to 8 minutes. 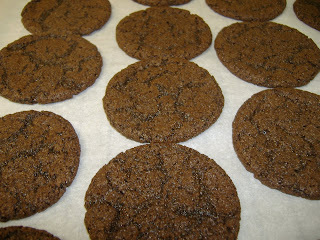 These cookies hardly spread at all, so don't be afraid to crowd them onto the cookie sheet. I squeezed about 16 onto my standard baking sheet. The longer I look at the photos I took of this recipe, the more I think they look like mashed potatoes sandwiched by thin hamburger patties. However, I assure you that this is all cookie - crisp, not too sweet chocolate ones with a sweet vanilla cream filling. 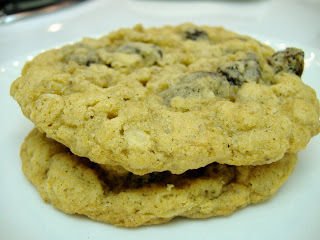 This recipe came from one of my favorite cooking blogs, Smitten Kitchen. As per her recommendation, I reduced the sugar slightly on these - using only 1 1/4 cups instead of the full 1 1/2. 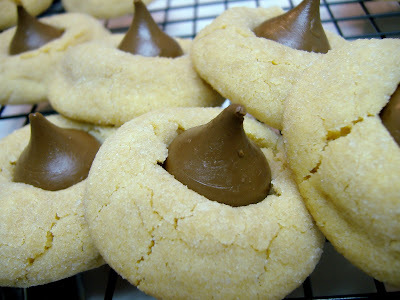 The filling for these cookies is very, very sweet, so I think that was a wise choice. I'm M.K., a 24 year old government contractor in Washington, DC by day, Martha Stewart wannabe by night.I never made any baked goods from scratch until about a year ago, when I finally had my own kitchen to wreck. I'm completely addicted to reading food/baking blogs, so decided to start a humble little blog of my own to document my baking adventures. - I soaked the raisins in hot water for about 15 minutes to plump them. I then drained them, and dried with a paper towel. These were VERY good, but not as special as I expected based on the reviews. If I make them again I'll add more cinnamon and a bit more salt. Walnuts or toffee bits would be a good addition as well. 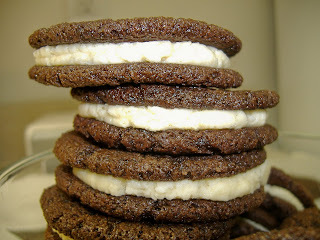 I have homemade oreos in the oven as I post this, so update on those later! Thanks for coming by SugarSugar!